The Preble County Board of Commissioners proclaimed Monday, Oct. 1 as Paint Preble Purple day for raising awareness in Preble County. Throughout the county, different organizations and businesses urged their employees to wear purple in support of domestic violence awareness. 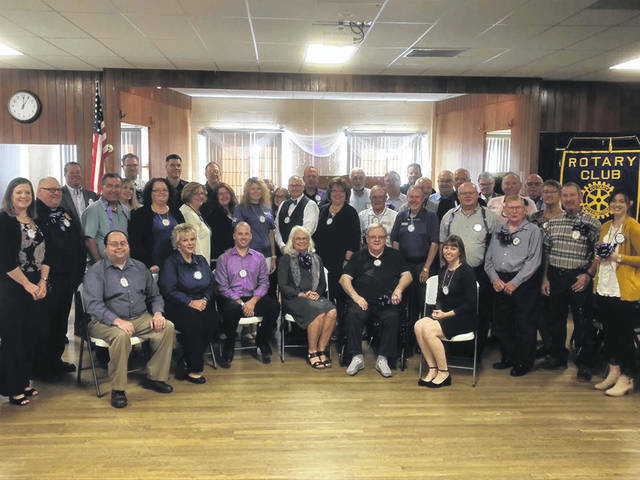 Eaton Rotary members posed for their Paint Preble Purple photo. 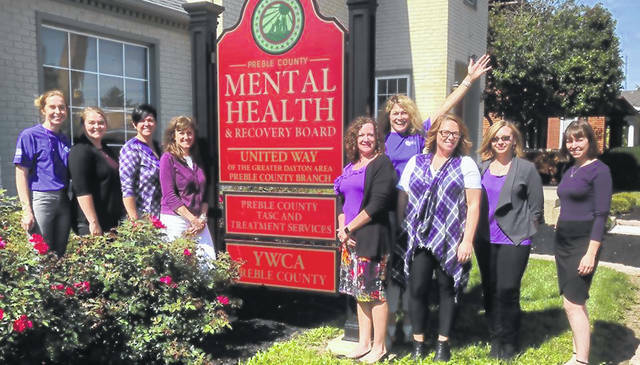 Preble County Mental Health & Recovery Board, Preble County TASC & Treatment Services, United Way of Greater Dayton Area’s Preble County Branch and YWCA Dayton’s Preble County Office pose for their Paint Preble Purple picture. 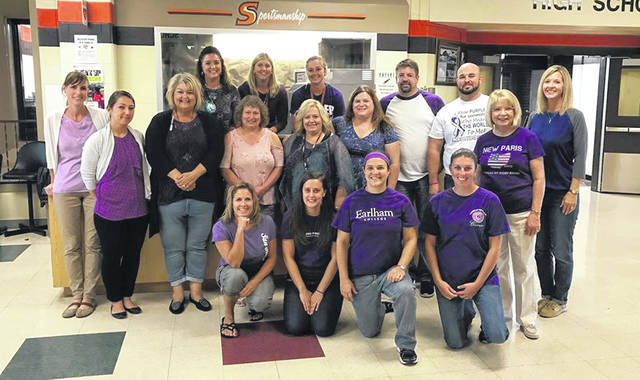 National Trail Local School District had the opportunity to pay $5 to wear jeans with their purple, raising $100 for the Preble County Domestic Violence Shelter. PREBLE COUNTY — On Monday, Oct. 1, businesses and organizations throughout Preble County encouraged employees to wear purple and “Paint Preble Purple” to raise awareness for domestic violence. More than 124 individuals and 20 groups/businesses participated in the day of advocacy. The event was planned by the YWCA Dayton/Preble County Office in answer to October being Domestic Violence Awareness Month. The Preble County Board of Commissioners even presented YWCA Preble County with a purple proclamation in recognition of the day. According to Audrey Starr, YWCA Dayton Director of Marketing and Communications, one in four women will experience domestic violence in her lifetime. In many cases, the signs of abuse are invisible: financial abuse and verbal abuse, for example. Starr added, financial abuse is the number one reason women can’t “just leave” abusive relationships – their credit history has been destroyed by their abuser, they don’t have a credit card or bank account in their name, they don’t have access to cash or transportation, etc. In 2017, the Preble County Domestic Violence Shelter provided more than 1,944 nights of stay and 4,160 hours of case management. In 2017, the Preble County crisis hotline received 215 calls, at an average of 13 minutes per call, with eight on site crisis support specialists. YWCA Dayton operates the only domestic violence shelter in Preble County. In 2017, 58 clients were served, including 24 children. They have a client satisfaction rating of 95 percent. Of those callers, 90 percent fully complete a safety plan. All Preble County staff are trained in Trauma-Informed Care and Crisis Prevention Institute (CPI) methods. In 2017, YWCA Dayton Preble County Office partnered with Samaritan Behavioral Health Inc. to provide a weekly, on site counselor to meet the needs of adult and child trauma survivors in shelter. They expanded their Rural Strategy to include domestic violence training workshops that look specifically at challenges experienced by survivors in rural communities. Finally, they were nominated for two Preble County Chamber of Commerce honors, including: Nonprofit Innovation Award and Young Professional of the Year Award for Preble Office Manager Courtney Griffith. “Domestic violence is a community issue. It is not just something that happens behind closed doors; it’s not simply a personal, private concern. Most recent studies cite the economic impact of intimate-partner violence in the U.S. at about $9.3 billion annually (in increased medical costs, loss of time at work, increased use of the shelter system, etc.) Breaking the cycle of domestic violence is something that should concern all of us, and takes all of us,” Starr said. “We are blown away by the immediate and enthusiastic support we received for our first-ever Paint Preble Purple campaign. Not only did the community step up to participate – several people went above and beyond and really got creative. 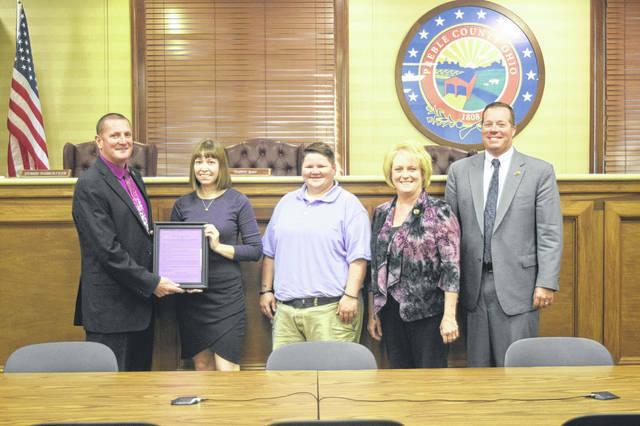 “The Preble County Commission issued a proclamation declaring October as Domestic Violence Awareness Month, and even printed it on purple paper. National Trail Local Schools asked staff to pay $5 to wear jeans with their purple to work, raising more than $100 for our Preble County domestic violence shelter.